Facebook and Google are taking a lot of heat for allowing falsehoods, packaged as news, to viralize across the internet, but lawmakers, who legitimize this fake news by spreading it, clearly contribute to the problem. Today, I’m calling on Colorado’s state legislators to be part of the solution, and join the fight against fake news, by signing the Fake News Pledge below. As a longtime progressive journalist and former media critic at the Rocky Mountain News, I believe it’s critical for our democracy that citizens aren’t manipulated by bogus information. By signing the pledge, lawmakers (and citizens) can help fight for facts and meaningful debate. There is no reason that all elected officials, from President-elect Donald Trump down, shouldn’t sign. But our focus now is members of the Colorado legislature. As an elected official, I agree that the spread of fake news on Facebook and other social media platforms has a toxic effect on rational civic discourse. And I understand that when community leaders spread fake news, we legitimize it. By our example, we encourage people to play fast and loose with facts, and we blur the lines between real journalism and fabricated stories masquerading as news. So, to promote informed and reasoned debate, I pledge not to knowingly spread fake news. If I accidentally do so, by sharing, “liking,” or posting inaccurate information, packaged to look somehow like news, I will remove the falsehood as soon as possible and post a correction as well as an explanation of why I posted it in the first place. If it’s deemed unproven or false or inaccurate by Snopes, Politifact, Factcheck.org, or by a respected news outlet, information from my Facebook page will be removed as soon as possible–or detailed reasons for not deleting it will be provided. It seems like a no-brainer that our legislators will sign our pledge posthaste. But in doing so, some of them will have to change their ways. 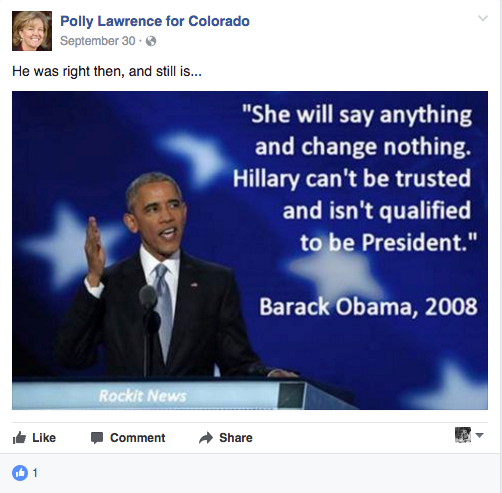 I looked at the Facebook pages of all Colorado state legislators from Oct. 1 until the November election, and I found that three lawmakers spread fake news during that time. 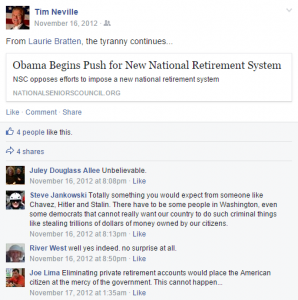 But it’s not true, as Snopes determined on Nov. 5, the day before Lawrence posted her “if-it-is-true” comment. DISCLAIMER: The Resistance may include information from sources that may or may not be reliable and facts that don’t necessarily exist. All articles should be considered satirical and any and all quotes attributed to actual people complete and total baloney. And even if there were no disclaimer on the website of the fake-news outlet, you don’t promote information that’s not from a trusted site, if you don’t know it’s true, especially if you are a legislator. That’s bad for representative democracy. 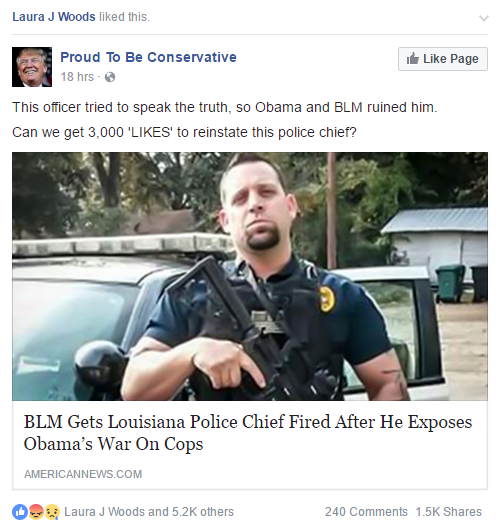 There’s no evidence the BLM had anything to do with the firing. This wasn’t the first time Woods, whose November loss means she’ll leave the state senate in January, has spread fake news on Facebook. 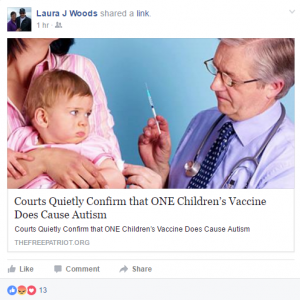 The Aug. 16, 2016, FreePatriot.org story, making the false claim about autism, is actually a reprint of a 2013 Whiteout Press article, the core facts of which were found to be false by Politifact back in February of 2015, over a year before Woods liked the fake-news item. Judging from his post, Klingenschmitt doesn’t appear to be fully convinced of the Scalia assassination “news.” But he posted it on Facebook anyway. Does anyone think lawmakers should post “news” that’s dubious actually a rumor, especially from a site like EndingTheFed that’s known to produce fake news? 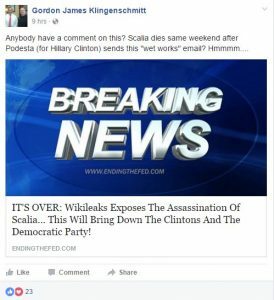 Yet, Klingenschmitt did not delete the fake news from his Facebook page, where it sits, rotting public discourse, to this day, like all the fake news I cite in this post. More anecdotal evidence, outside of our pre-election analysis, shows Colorado legislators are spreading fake news. “She will say anything and change nothing. Hillary can’t be trusted and isn’t qualified to be president.” Barack Obama, 2008. 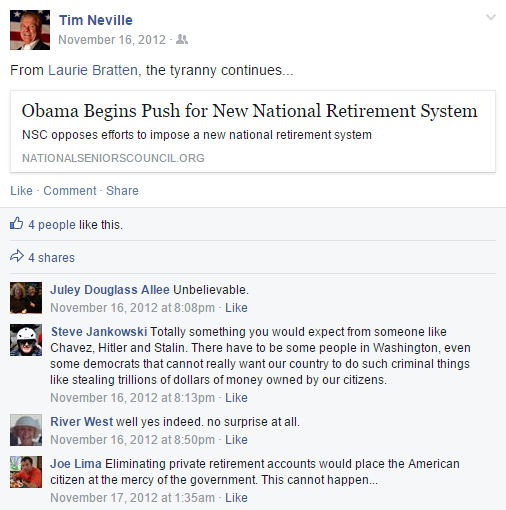 “He was right then, and still is,” wrote Lawrence on her Facebook page. One big problem. While the first sentence is Obama’s, the second was never uttered by him. About a year before Roupe spread this, Snopes had dutifully researched this topic, concluding Roupe’s public service announcement to be false. A: No. Obama endorses a proposal that would require businesses without retirement plans to establish private IRAs for their employees and deposit a percentage of wages into the accounts. Employees could opt out. 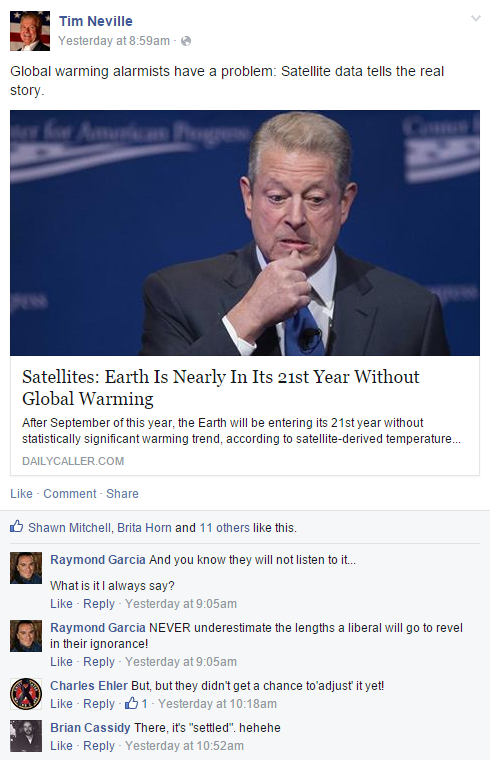 In July of 2015, Neville posted a fake-news meme, published by the Daily Caller, with the headline, “Satellites: Earth Is Nearly in Its 21st Year Without Global Warming.” The linked article allegedly cites satellite data showing a “prolonged hiatus” in global warming. 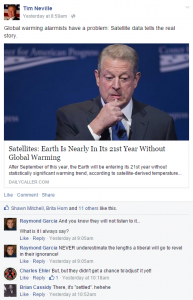 But about four months before Neville posted this comment, Factcheck.org showed it to be false, stating that the “world has now gone 30 consecutive years — 360 straight months — where every month has been above the 20th century average, according to the National Oceanic and Atmospheric Administration.” Factcheck.org and other news outlets specifically cited the satellite data as not proving a warming hiatus. 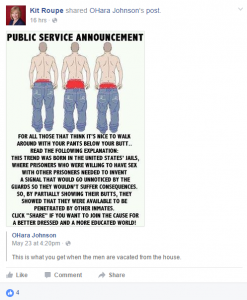 So far, it appears that few elected state officials have been spotlighted for spreading fake news on social media. Two examples, compiled in a post on the Colorado Times Recorder yesterday, are State Rep. Tim Couch (R-Hyden) of Kentucky and California Assemblywoman Melissa Melendez. 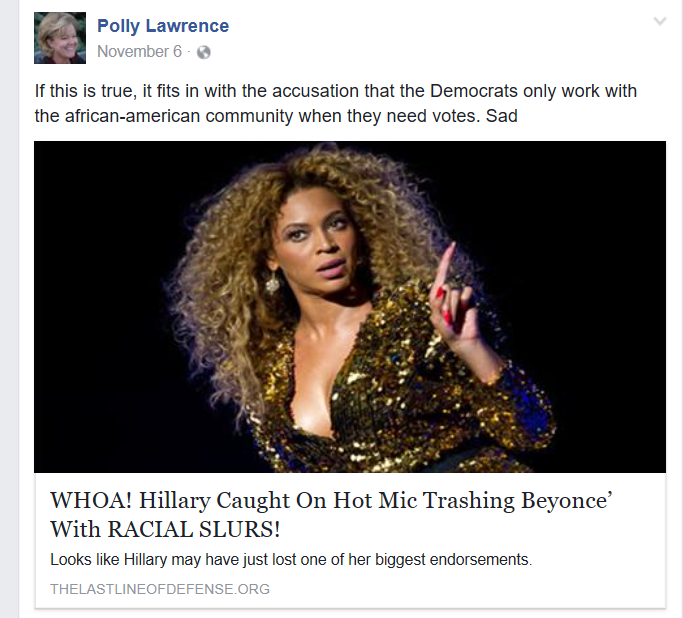 A wider look at the role of lawmakers in spreading fake news is called for, particularly after officials connected to the Trump campaign, including his pick for national security advisor, Lt. Gen. Michael T. Flynn, promoted Clinton falsehoods on Twitter or Facebook. The issues around fake news are numerous and complex. But that doesn’t mean people in Colorado can’t do anything about it. This starts with our elected leaders who clearly add legitimacy to information they spread on Facebook. So elected leaders everywhere should step up and sign pledge. Lawmakers deserve to be held accountable for spreading fake news, but all of us–not just our elected leaders and regardless of where we fall on the political spectrum–can pledge not to spread fake news. That’s why we’ve also created Fake News Pledge for Citizens. Everyone can sign it here. In the coming months, we’ll be tracking how many of Colorado’s state legislators add their names to the pledge–along with everyday citizens. We’ll see if lawmakers from around the country sign. And we’ll cast a wider net, looking at lower level office holders in Colorado, to find out if more of our elected leaders are spreading fake news. Stay tuned. Michael Lund and Madeleine Schmidt provided research assistance for this post. After a six-year run, John Rebchook has shuttered his Denver Real Estate Watch blog, but he’d fire up the platform again if the right sponsor makes the right offer. A former Rocky Mountain News reporter, Rebchook practiced independent journalism under a for-profit business model, funding his blog through sponsorships. Does he think, based on his experience, that the for-profit model is unworkable for journalist like him covering real estate or related issues? Asked about remaining real estate coverage in metro Denver, Rebchook said there’s a handful of news entities still covering beat, which, he pointed out, has wide interest. “There’s more coverage of real estate than the marijuana business,” he said. Rebchook is working part time at the Colorado Real Estate Journal, a trade publication for commercial real estate. In a ironic twist, a billboard promoting atheism has prompted a Colorado Springs radio host to attack the religion of Islam. Demonstrating the same brazen bigotry of KNUS host Peter Boyles, not to mention Trump, KVOR 760-AM host Richard Randall said Thursday that if athiests have a “problem with religion,” they should after Islam. “If they have a problem with religion, why don’t they start there [with Islam]?” Randall asked, failing to note any distinction between Islamic militants and the religion of Islam. A caller suggested the billboard, which is protected by free speech, should be removed by the government because it’s distracting drivers. It’s a safety issue, she said. The bigotry of talk radio hosts would be bad enough if we didn’t have a bigot president-elect who’s proposed creating a Muslim registry. But since we do, we need to be ready to respond if Randall, Boyles, Trump, or anyone else in these hateful times goes after our Muslim neighbors. In case we need to respond, ProgressNow Colorado has set up a “rapid response” network so we can help if needed. Sign up here. What reality is she in? The conservative-media-bubble reality, of course. Talk radio, Facebook, etc. If you listen to KNUS 710-AM or follow Woods on Facebook then, yes, you might actually think meanie libtards are out their waiting to viciously attack you if you drop the Merry-Christmas bomb. It’s a manufactured reality. It’s sad that Woods, who lost her seat in last month’s election, apparently believes it. And I’d like the opportunity to discuss her Facebook like, first revealed by Charles Buchanan on the Colorado Times Recorder, but she doesn’t return my calls. 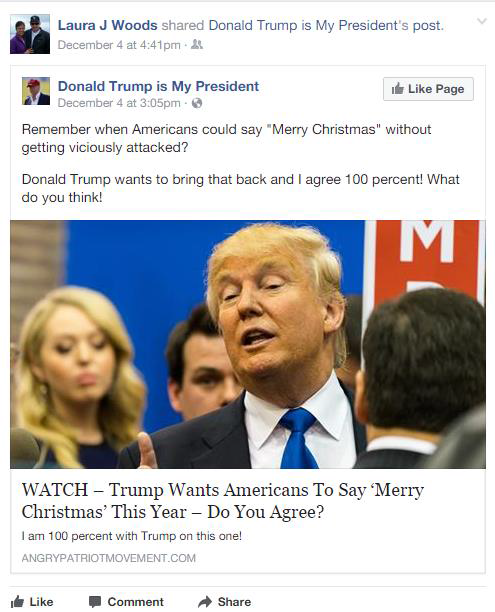 Woods might say that disputes about the phrase “Merry Christmas” occur in the real world, outside of talk radio. And they do, especially about its use in public places. And they can be a bit vicious, no question, at times. But this is rare. It’s conservatives, firing up the air in their bubble, who perpetuate the myth of viciousness, as Woods did this week on her Facebook feed. You are currently browsing the The Big Media Blog weblog archives for December, 2016.